Do you want an activity where you want to have certain obstacles? Tie up game implies all this because you have to do something with the tied hands. In this game, groups of people are involved to perform certain tasks by the organizer. Tie Up Game can be played outside as well as indoors, depending on how time is. A larger group of participants may be involved in the game because the members will be divided into two teams. And their purpose is to do some activities together. • Pour a cup of water for each person in the group. Step 1: Those willing to participate in this game are arranged in a line and count from one to two. This will form 2 teams. Step 2: The players in both teams must be face to face and join one another. Then each participant in the team is bound to each other by a rope. Step 3: The leader of the game must have in time ready all the tests that the teams must meet. 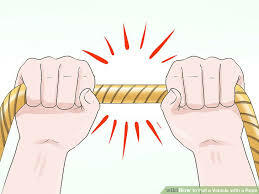 The tests do not have to be very hard because the participants are tied to the hands. ‍Step 4: You have to follow, each test how it is done, so as not to create a divergence between teams. They must also check the quality of the evidence. Step 5: Points will be awarded for each completed test. Following all activities, we calculate the total amount of points in both teams. The team that gathered the most points will be considered as winning. Step 6: It is good and beautiful for those who have won to be remunerated with a little surprise. In this way, their work will be appreciated and encouraged. Because it is a team game, it must be considered that it is necessary for a good communication and flexibility of the group. Not everyone is endowed and good in everything. Therefore, those who are better at evidence must help others to achieve their goals. Be the one who encourages all members because spiritually the team can make a difference.